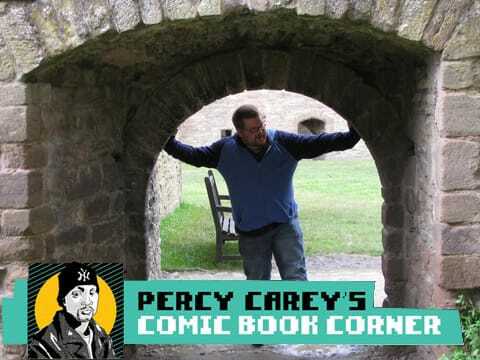 Percy Carey: How long have you been writing for Geek Monthly? Jeremiah Griffey: I first picked up the magazine in February of 2007. They had Kristen Bell on the cover and I have a massive crush on her, so I bought the magazine with no reservations. I flipped through and noticed they only had one CD review in the whole magazine before realizing it was only their second issue ever. I emailed somebody and [Editor-in-Chief] Jeff Bond emailed me back. I did the CD reviews for issue four and have been handling the majority of music interviews and reviews ever since. After the magazine was purchased by Fusion, I was pretty concerned that I might lose my position as Music Editor, and for about two issues I did to some guy who wrote for Play, but I snuck back in there and have since interviewed the likes of Liars, Method Man, Les Savy Fav, Animal Collective, TV on the Radio, Islands, The Melvins, Mike Patton, and Moby. Percy Carey: In your own opinion, who does Geek appeal to and why? Jeremiah Griffey: The magazine appeals to anyone with passion for anything, whether that passion be for music&apos;my geekdom of choice&apos;movies, anime, video games, strange new candy or comic books or television. Percy Carey: Ã¢â‚¬Â¨You seem to have the perfect balance of multiple mediums&apos;comic books, Ã¢â‚¬Â¨film, television, music. What is your formula for success? Percy Carey: What qualities does Geek look for when considering a cover story? Jeremiah Griffey: Anyone with whom we can get a photo shoot! In all seriousness, the cover stories tend to be actors or directors involved in projects with some form of geek appeal. Primarily we aim for film actors, but also dip into the likes of Heroes and Lost, occasionally. Percy Carey: Ã¢â‚¬Â¨Name one of your all time favorite interviews in Geek Monthly. Jeremiah Griffey: If you&apos;re asking for an interview I&apos;ve conducted, I&apos;ve got to say Maynard James Keenan from Tool. I&apos;ve been a Tool fan since I was about 16, so actually speaking with him was probably as intimidating as it gets. I don&apos;t get star struck, but I do have mental blocks about speaking with people I know are more intelligent than I am. For this reason, I&apos;d have a lot of difficulty interviewing Thomas Pynchon, David Lynch or Salman Rushdie. Maynard ended up being a pretty nice guy. If I asked a question he didn&apos;t care for, he gave a four-word answer. If I asked a question he was into, he talked for minutes. It all worked out. If you&apos;re asking for an interview I&apos;ve read in the magazine, there are almost too many to count. I&apos;m jealous that I didn&apos;t get to interview John Goodman, that&apos;s for sure. Ã¢â‚¬Â¨Percy Carey: Who is your favorite comic book writer and why? Jeremiah Griffey: Interestingly, I only recently got into comic books. I grew up in a part of rural Upstate New York where comic books weren&apos;t popular at all, and even though I knew I&apos;d like comic books, there was no one to share the experience with. I&apos;m still plugging my way through the classics&apos;The Watchmen, The Dark Knight Returns, etc. I do however know that Ben Templesmith, who I learned about in Geek, is my favorite artist, bar none. Jeremiah Griffey: I think Y: The Last Man would make an excellent HBO or Showtime show. Ã¢â‚¬Â¨Percy Carey: What are your thoughts regarding the current state of the industry (comic books/film television/music)? Do you see room for growth? Comic Books: I think their ability to tell divisive and unique stories is endless. Television: This is the best era of television ever. TV shows have the ability to tell more expansive stories than movies ever will be able to tell. When I was reading the first four books of George R.R. Martin&apos;s A Song of Ice and Fire, I couldn&apos;t help but think, "This is amazing, and it could never be a movie." Then HBO bought the rights, and I got giddy. Dexter, Lost and The Shield are just a couple of the great active TV shows available for human consumption. Back to Film: Big budget action flicks like Iron Man will always be there, but film cannot compete with raw, well-crafted television. Jeremiah Griffey: Don&apos;t expect to make any money and only cover what you want. If you&apos;re writing for a publication that wants you to cover things you don&apos;t believe in, quit, unless you want to make a living writing about The Hills and Kim Kardashian. I&apos;m so fortunate that Geek allows me the freedom to cover music I believe people should be exposed to, rather than making me cover drivel that sells albums. Ã¢â‚¬Â¨Percy Carey: What can we expect from Geek in the future? Jeremiah Griffey: In the music section, you can expect me to continue to try to write about a nice mix of established and up-and-coming, slightly left-of-center music. As for the magazine as a whole, it&apos;s tougher for me to say. I hope we get some more ladies on the cover (Rosario Dawson...Where you at??). I also hope Conan O&apos;Brien gets his wish and makes it onto the cover. Jeremiah Griffey: Hip-hop culture has been directly influenced by Geekdom for years. I should amend that&apos;good hip-hop culture has been directly influenced by Geekdom for years. However, the obscure references by artists such as the Wu-Tang Clan, Subtitle, Busdriver, Cadence Weapon, Mr. Lif, Aesop Rock and others get overlooked by the contrived T&A, bling, drugs and violence of contemporary mainstream hip-hop. Perhaps, with real rappers making real comic books, some kids will notice and embrace the connection. Percy Carey: In the movie John Solo: Secret Agent, who would you like to see play the roll of John Solo? George Clooney or Brad Pitt? Jeremiah Griffey: Is it bad that I had to Google John Solo to know what this question means? Art by Darwyn Cooke, David Lapham, Chris Weston, Dean Haspiel, Ty Templeton, Darick Robertson and others. Two assassins. One hero. It didn&apos;t end well. But Elektra&apos;s death was only the foundation for one of Frank Miller&apos;s most staggering sagas of the Man Without Fear! The Hand and the Chaste are in a race for Elektra, body and soul, and Natasha Romanova, the Black Widow, almost follows her rival into the grave while Daredevil&apos;s trapped in a coffin of his own design! Can his sarcastic sensei Stick rescue him from sensory overload, just in time for hand-to-Hand combat? Plus the continuing tragedy of Heather Glenn, Foggy Nelson&apos;s foray into organized crime, a path not taken to the SHIELD Helicarrier, and the only villain who gets less respect than Stilt-Man...a second Stilt-Man! Featuring the Kingpin, Bullseye, and Hydra! Collecting DAREDEVIL #185-191, #219; DAREDEVIL: LOVE & WAR and WHAT IF? #28. A KOTOBUKIYA Japanese import! With a discharged grenade at his feet and the translucent bubble shield dissipating, the UNSC elite super soldier STEEL SPARTAN readies his armaments and begins to rise. The Spartan holds two Submachine Guns, or you can switch the bonus arms and have him grip his M90 Shotgun (CAWS- Close Assault Weapon System). When not using the Shotgun, it can be stored on his back. Additional hands are also included for expression, and as a special bonus for fans that collected the other Kotobukiya ARTFX Statues, you can swap some of the weapons and hands with the other releases (Master Chief Field Of Battle, Master Chief, Blue Spartan, Red Spartan, and others)! The Steel Spartan is a Limited Edition of only 2000 pieces worldwide. At last, it&apos;s here - the first of three hardcover volumes collecting nearly every DC Comics story and cover by Neal Adams not already collected in GREEN LANTERN/GREEN ARROW, BATMAN or DEADMAN titles! Featuring rarely seen stories from OUR ARMY AT WAR #182, 183 and 186, STAR SPANGLED WAR STORIES #134 and 144, DETECTIVE COMICS #369, TEEN TITANS #20-22, ACTION COMICS #425, SUPERMAN #254, WEIRD WAR TALES #12 and 13 and more!